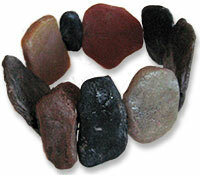 My Sedona stones polymer bracelet is part of a continuing fascination with rocks, this time with flat shapes and western red rock colors. My petroglyphs, based on the ones we saw at nearby ruins, aren’t quite ready for display. You’ll understand my obsession better when you look at the pictures from our hikes through the local canyons and along the rivers. Sedona is a rock lover’s paradise. Allowing your surroundings to influence your art is an immersive experience. I was pleased to see the works of Barb Fajardo, Tish Collins and Gwen Pena in one gallery in town. Three in one gallery! Excellent! Ohhhh Cynthia ….. they are beautiful! It reminds me of home on the farm in SA and all the beautiful rocks and stones I always brought home to mom as little gifts. The bracelet is outrageously COOL. The pictures remind me of the shores of Lake Superior. I gather rocks and pebbles from there all the time and use in my jewelry and home decor. I just made a bracelet with some pebbles and Vintaj brass and I’m working on a necklace with sea glass. I do understand your fascination with rocks. I would never guess looking at these that they aren’t rocks. You have really captured the texture and the random shapes of real stones. I can’t wait to see the petroglyphs! These are so cool–I love the suggestion of weight that will shock the wearer when it turns out to be non-existent. Polymer clay pebbles are an obsession all by themselves–whether mimicking nature faithfully or creating otherworldly specimens…have you seen Pati B’s petroglyphs? Way cool. I especially like the really shiny black one right in the front and the fact that these aren’t smooth like some of your other rocks I’ve seen. Your rocks are so amazing and realistic. KUDOS! I am also rock-obsessed. Guess hiking in the Sedona/Verde Valley every day does that to you . Your video Faux Beach Pebble class at craftcast.com is on the top of my “wish list” when the tax refund comes in. Curious which gallery is the one with the PC pieces? I spotted Jon Anderson’s work in a gallery, but not the others. I can’t wait to get to your site daily. It inspires and motivates me. Keep it coming. Definitely amazing, I have to agree! I wish I could see them close up. Wow! Oh, lovely. And very realistic. Makes me want to run my fingers over them and ground myself. So glad that you were inspired and invigorated by your wonderful vacation and honored that you shared with us! Cynthia, this bracelet is fantastic! I’m so inspired by your incredible talent.